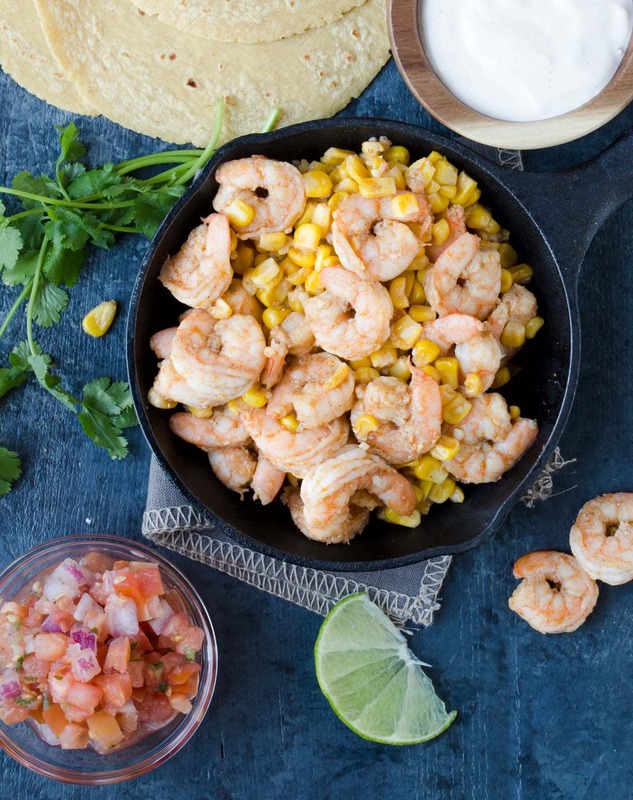 These flavor-packed Shrimp Tacos with Chipotle Cream are great for entertaining a group. And the best part? They are ready to serve in 30 minutes. Looking for a little something different for your next gathering? Taco bars are always a hit with a group, and these easy Shrimp Tacos with Chipotle Cream are a great change from your traditional beef tacos. Most everyone likes Mexican food, and that makes tacos a great choice for a party. Shrimp Tacos just scream spring to me, so light and flavorful. And easy. I love easy. Sear the shrimp in the pan with cajun seasoning, garlic, and a squeeze of fresh lime juice. Add some charred corn and top it all with a smoky chipotle cream. How can you go wrong with a flavor combination like that? Short answer: You can’t. And the best part is you didn’t have to spend a ton of time slaving away in the kitchen. And while some taco bars can be a lot of work prepping condiments, that is not the case here. 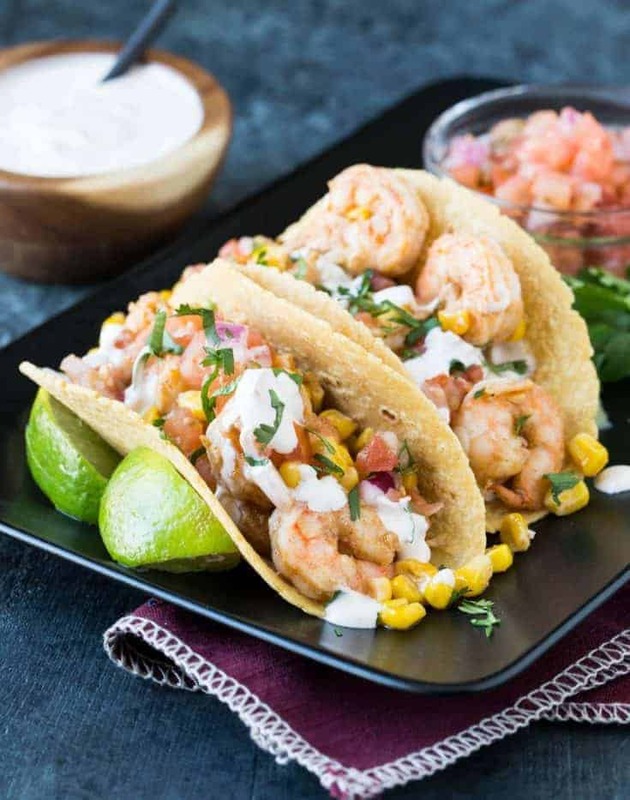 Simply place the tortillas in a warmer, plate the shrimp and corn mixture, set out some pico de gallo, and the chipotle cream. Garnish with some fresh cilantro and you’re in business. How’s that for easy? Round out the spread with some Copycat Corn Salsa, Pico Guacamole, Tomatillo Salsa and a big bowl of chips. Snacks and dinner done. Just like that. Cocktail Tip: Margaritas and tacos are a match made in heaven, right? These Golden Margaritas are easy to make as a batch cocktail! Place all ingredients in a bowl and stir until combined. Can be made ahead. Refrigerate until ready to use. Place shrimp in a medium bowl and add cajun seasoning. Toss to coat and set aside. Heat a large nonstick skillet over medium high heat and add olive oil. When olive oil is hot, add garlic and cook for 30 seconds (or until garlic is fragrant). Add shrimp and cook for 2 minutes. Add corn to skillet and squeeze the lime juice over shrimp and corn. Cook until shrimp is pink and cooked through, about 3-4 minutes. Serve immediately with flour tortillas and garnish with fresh cilantro, chipotle cream and avocado, if desired. ummmm…wow, drooling! i always forget about shrimp and need to add them into my dinner routine more often. Love shrimp tacos! Never thought about adding corn, too. These look super yummy! I’ve never made shrimp tacos, but it’s a MUST now!!! I’m like you – I used to always buy p & d shrimp, willing to pay more for the convenience, but after spending just five minutes with that OXO shrimp tool yesterday, it sort of changed my life! I’m not even one who’s really gung-ho about having lots of gadgets around, but this thing rocked my world! Love this recipe. So fresh, colorful, healthy and tacos are always a crowd pleaser! Love the recipe. Just to let you know the sweepstakes entries for me do not give me the option to “like” on Facebook. I had to go to each Facebook page to click like! This stuff just EATS up my Data! Thanks for the heads up about that, Dee! We are looking into that, sorry for the difficulty! Seriously drooling. My stomach is saying we are going to Lisa’s for supper tonight!! AHH- a dish after my own heart. Am I weird that I love to peel and devine shrimp? I find it therapeutic. Probably because I have been doing it my whole life. I also love snapping the ends off green beans. But I digresss. Will have to try this recipe. Looks delish! Looks so good! I love shrimp tacos and your cream sauce sounds delicious. Loving all the shrimp I’m seeing around, especially these. Love the chipotle cream! These Shrimp Tacos look scrumptious! I wish I had some for lunch today 😉 Your recipe sounds wonderful, pinning! Loving your recipe…chipotle with shrimp is SO good! Chipolte sauce/ salad dressing/ dip is my new favorite. I live in an area that has an upcoming Shrimp Fest in May. Oh my! Oh my! Oh my!